PITTSBURGH (August 20, 2018) … A research collaboration led by the University of Pittsburgh's Swanson School of Engineering is one of 15 national projects to receive nearly $8.8 million in Department of Energy (DOE) funding for cost-shared research and development initiatives to develop innovative technologies that enhance fossil energy power systems. 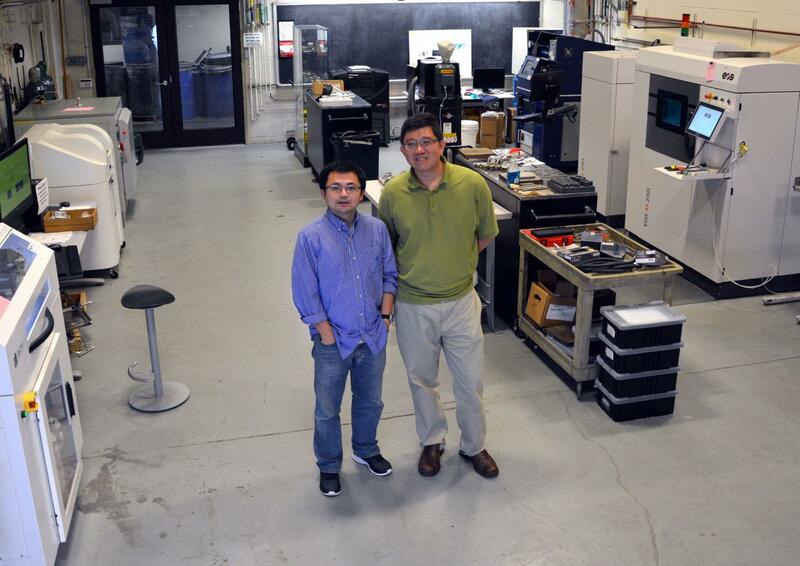 The proposal, "Integrated Computational Materials and Mechanical Modeling for Additive Manufacturing of Alloys with Graded Structure Used in Fossil Fuel Power Plants," was awarded to Wei Xiong, PhD (PI), assistant professor, and Albert To, PhD (Co-PI), associate professor in the Swanson School's Department of Mechanical Engineering and Materials Science. Their collaborator is Michael Klecka, PhD at the United Technologies Research Center (UTRC), headquartered in East Hartford, Connecticut. The team received $750,000 in DOE funding with $187,500 as the cost share. DOE's National Energy Technology Laboratory (NETL) in Pittsburgh will manage the selected projects. "Wire-arc AM is a promising technique to build complex parts for fossil fuel plants. However, the operational environment of these plants requires resistance to very high stress, temperatures, and oxidation, and so we need to develop a new paradigm in computational design," Dr. Xiong explained. Dr. To also noted, "Optimizing materials composition and processing strategy, combined with ICME modeling to improve the part design and reduce failure, will be a game-changer for the industry." AM has significantly expanded the development of complex parts thanks to the joining of dissimilar alloys, enabling the creation of stronger, lighter, and more affordable components compared to traditional manufacturing. In particular, the ability to control the manufacture of a part's micro- and macro-structure is what makes these components superior, but this requires greater computational control over the manufacturing. "Thanks to additive manufacturing, in the future, industrial plants of various types will have the capability to repair or replace components on-site," Dr. Klecka at UTRC said. "This will enable utilities to improve operations and invest resources more effectively." Dr. Xiong's research and the other projects fall under DOE's Office of Fossil Energy's Crosscutting Technology Research Program, which advances technologies that have a broad range of fossil energy applications. The program fosters innovative R&D in sensors and controls, modeling and simulation, high-performance materials, and water management.